Here at Angel Eden we are always looking for creative ways to use up left over pieces of materials from our various crafts. So when we heard that Oxfam were looking for knitters to help them raise funds we were keen to get involved. Anne and I both have a huge amount of leftover wool from various projects, too nice to throw away but too small to use this seemed like a wonderful opportunity to not only clear some space but help out a worthy cause at the same time. 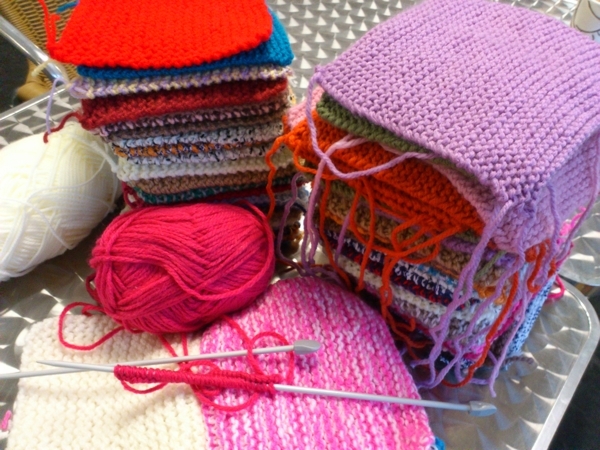 The idea is simple, enthusiastic knitters knit small squares which can then be sewn into a larger blanket. These are then taken along to local and national festivals and sold to raise funds for the charity. In 2010 the blankets raised £6000 at just one music festival alone! We began by knitting six inch squares, but it soon became apparent that it would take a considerable amount of time to complete a 6ft by 4ft blanket. With this in mind we are endeavouring to enlist fellow knitters in this most worthy of causes.We have had a great response on Twitter already but are now hoping to get you guys involved as well. Squares are knitted in double knitting yarn on size 8(4mm) needles. We cast on 30 stitches and knitted 56 rows in garter stitch to make a square. Basically we are looking for six inch squares knitted in any colour of DK yarn and we will sew them together into blankets. Contact Anne or myself by email, facebook or through Twitter for details of where to send your completed squares. This entry was posted in Miscellaneous, Tutorials and tagged blanket, blankets, charity, craft, festival, knit, knitting, music festival, oxfam, tutorial. Bookmark the permalink. Count me in. Load of spare wool and time to knit. Me and some friends knitted and crochet blanket squares for Refuge last year.It’s a very rewarding project what ever the charity. We can make them would love to help,please send details where to send them. 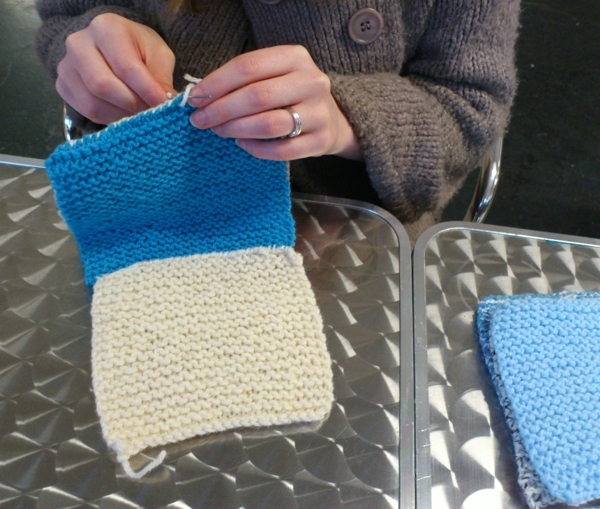 my name is hayley and im knitting for a local hospice – im in need of 6 by 6 inch squares ( that i can sew together) or 10 sqaures 6 by 6 that are already sewn they will then by draped over a double decker bus for a carnival in my local area of lymington hampshire please can anyone help ?